Place the golden beetroot in a small baking dish and the red beetroot in a separate dish. Mix to combine the vinegar, sugar, oil, salt and pepper and pour over the beetroot. Cover each tray with aluminium foil and roast for 50 minutes. Remove the foil and cook for a further 10 minutes. Peel the beetroot while they are still warm and slice into 5mm rounds. Set aside. Heat the vincotto and butter in a 23cm non-stick frying pan over medium heat. Bring to the boil and cook for two minutes. Remove from the heat and place the beetroot across the base of the frying pan. Using the pan as a guide, cut a 23cm circle from the puff pastry and place on top of the beetroot, tucking it in around the edges. Bake for 30–35 minutes or until puffed and the pastry is deep golden. 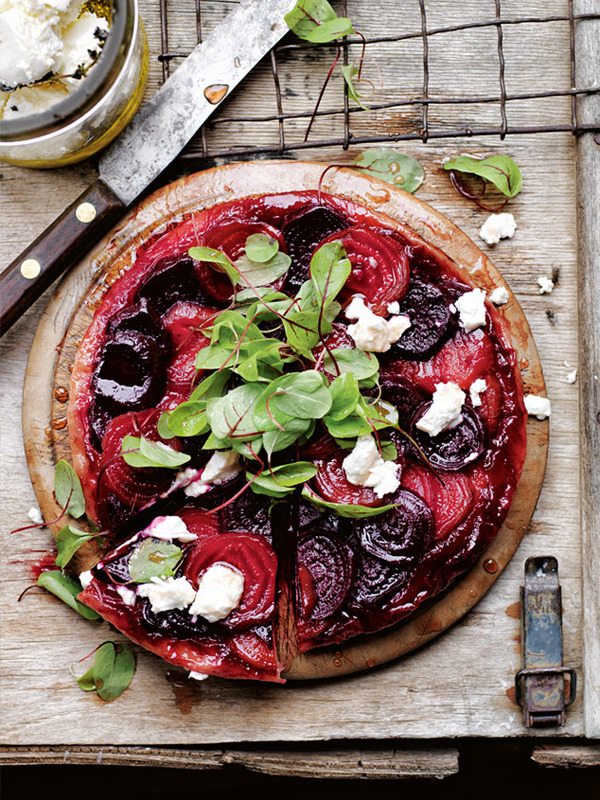 Carefully invert onto a large plate, top with the goat’s cheese and beetroot leaves and serve immediately. Serves 4. + Vincotto, meaning ‘cooked wine’ is a sticky-sweet Italian condiment made from grapes. Find it at delicatessens and specialty food stores.